Ždiar lies beneath the Belianske Tatry Mountains, in the valley of the Beliansky brook, on the main road from Poprad to Zakopané. In the period of its origin, at the turn of the 16th and 17th centuries, its belonged to the Lendacky estate. The inhabitants of the village, based on the shepherd’s law, engaged mainly in pastoralism, mountain farming and woodcutting. The village development extending along the brook is characterised by closed-in yards, with a house situated with its longitudinal side to the south, in the northern backyard, in parallel with the house, is a higher passageway barn with the stable. Smaller homestead sections, pigsties or fences complement the closed-in groundplan of the farmyard on both sides. 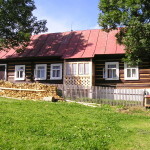 The village features two log-type houses with distinct disposition: the Ždiar-type, with asymmetrically arranged spaces, and the Zakopane (‘Polish’)-type with a pitvor (antechamber) located in the centre of the disposition. The original coloured tone of the housing development was highlighted by the light blue hue of the moss and clay coating which filled the spaces between logs in the living section, and the red window frames decorated with simple ornamentation. The present-day village has 183 national cultural monuments on display.